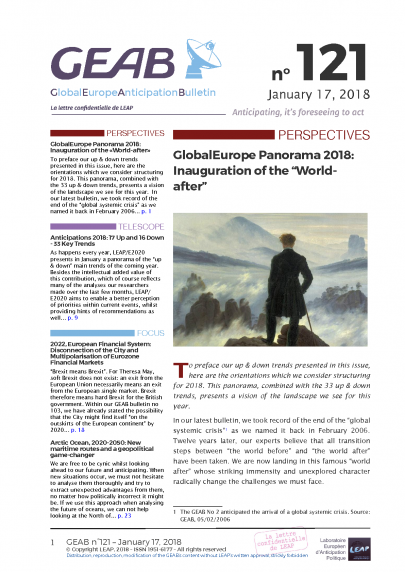 As happens every year, LEAP/E2020 presents in January a panorama of the “up & down” main trends of the coming year. Besides the intellectual added value of this contribution, which of course reflects many of the analyses our researchers made over the last few months, LEAP/E2020 aims to enable a better perception of priorities within current events, whilst providing hints of recommendations as well. 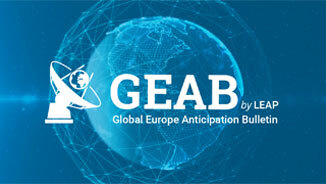 Concretely, this list helps the GEAB readers to prepare for the coming year. With success rates varying between 69 and 85% over the past twelve years (75% in 2017), this annual exercise is therefore a particularly concrete decision tool for 2018. The “revolts” generated by the crisis at its beginnings (Indignados, occupy movements, etc.) are getting “horizontalised”. Initially directed against leading elites, they are now increasingly against “the others”, whoever they are: women against men, white against dark, Catalans against Spaniards, Germans against French… The hatred speech is more and more trivialised and channelled by radical movements, in turn strengthening the trend, some of which won’t hesitate to resort to violence. Our team anticipates the arrival of the first far-right militias in Europe sometime this year. The previous trend leads to a popular demand for increased surveillance and undermined individual freedom. This request will be too happily honoured by authorities in an easy convergence with populist movements. This trend is not new, but we will see it getting stronger in 2018.